Where we lived: Taylor’s Crossroads. | Scuffalong: Genealogy. Where we lived: Taylor’s Crossroads. – Scuffalong: Genealogy. Where we lived: Taylor’s Crossroads. 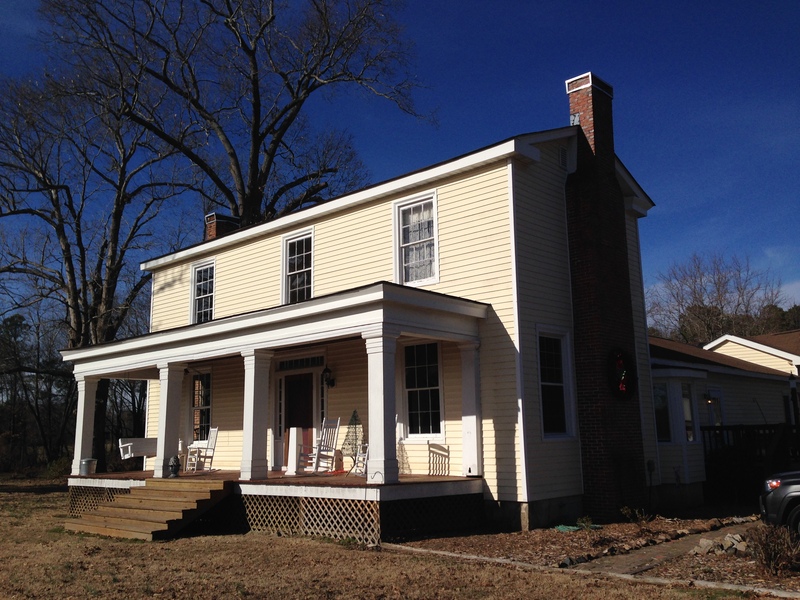 A plat included among Kinchen Taylor’s estate papers revealed the core of the man’s property. With little difficulty, I matched waterways shown on one parcel with creeks running in modern Nash County. Fishing Creek forms its northern border with Halifax County, and Beaverdam Swamp flows into it a few miles northwest of the town of Whitakers. The hundreds of acres in the fork of these creeks belonged to Kinchen Taylor. For years I harbored a fantasy of hiring a prop plane to fly over this land while I scoured the ground for brick piers and broken chimneys and heaps of hewn logs and any other traces of Kinchen’s plantation. On disgracefully short notice, I emailed B.B. just before I went home last December. Would he have some time to show me around over the holidays? We made tentative plans for after Christmas and firmed them up a few days later. B.B. had to leave town for work, but his wife A. was more than happy to give me a tour. (A) marks the location of the largest chunk of Kinchen Taylor’s property at the fork of Fishing Creek and Beaverdam Swamp. (At some point the confluence was dammed to create Gum Lake shown above.) (B) is where Kinchen C. Taylor built his house, probably in the 1850s, on land inherited from his father called the Duncan Cain tract. A.B. warmly welcomed me when I pulled up beside the house. 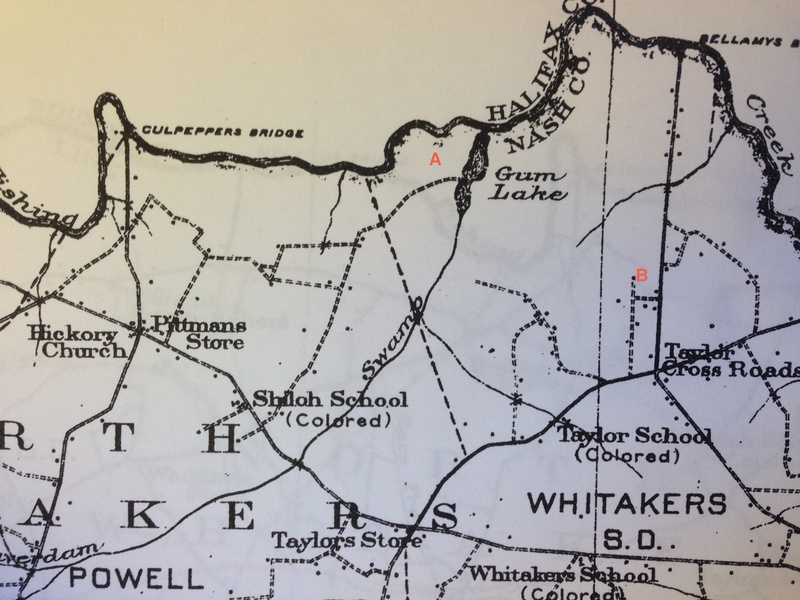 She graciously shared not only the photo above, but a map drawn by Kinchen C. Taylor’s nearly 100 year-old grandson that showed the locations of surrounding outbuildings, groves and pastures. Where possible, the character of the original house has been preserved in its interior, and I could not help but wonder if my Taylors, Green and Fereby, who had belonged to Kinchen C.’s father, had ever walked where I did. Even if not, they surely knew this house and were intimately familiar with its inhabitants. Many thanks to Mark Bunn for alerting me that this house is still standing and putting me in touch with its owners and to them for opening their doors to give me a glimpse of my family’s world. Pingback: Where did they go?, no. 4: Taylor. | Scuffalong: Genealogy. 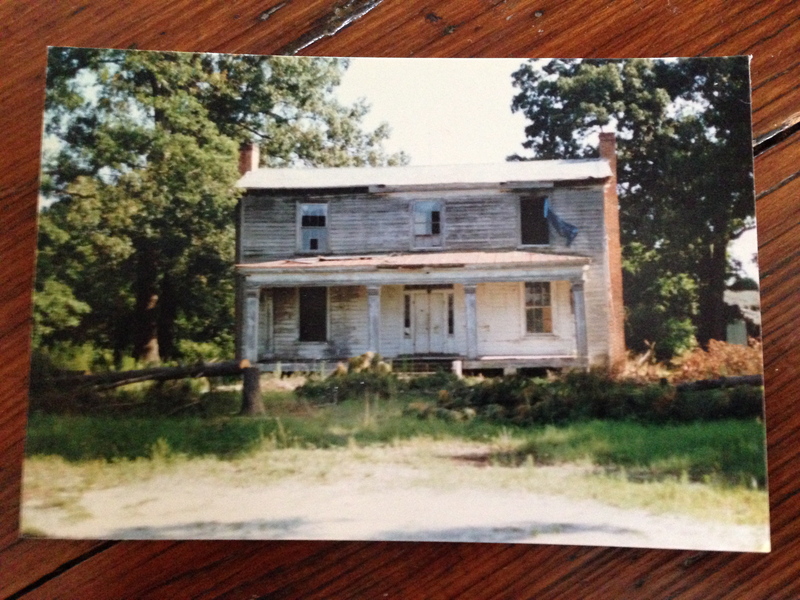 Pingback: Kinchen’s Kinchen’s Kinchen’s Kinchen …. | Scuffalong: Genealogy.